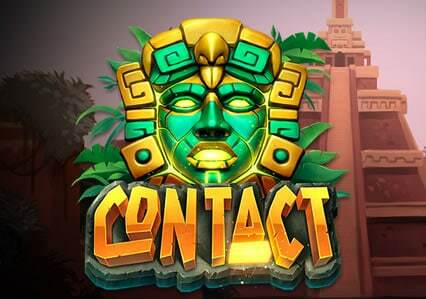 Mr Green Casino are offering you the chance to make ‘Contact’ with up to 50 bonus spins on the latest video slot from Play ‘N Go. The promotion is simple – you need to make a deposit to get bonus spins. You will receive 1 bonus spin for every £2 you deposit – for example, if you were to deposit £100, you would get 50 bonus spins. It’s that simple. The minimum deposit is £30 (to give you 15 bonus spins) and all winnings from the bonus spins comes from 35 times wagering requirements. 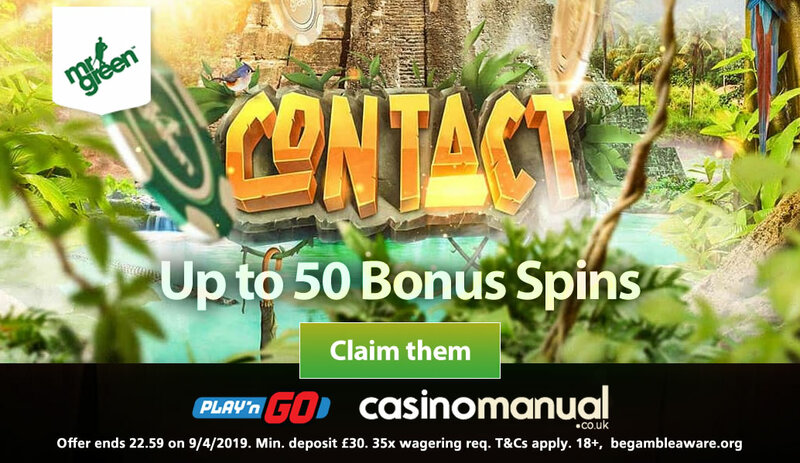 Contact is the latest release from Play ‘N Go and has 5 reels – with a cluster pays engine, you can spin away from just 20p per spin across desktop, mobile and tablet devices. With a Mayan theme, you are taken to a jungle pyramid where you’ll see animal carvings and Mayan masks as symbols – 5 of more of the same symbol in a cluster will award a winning outcome. It comes with a cascading reels engine – when you win, the losing symbols disappear meaning you can add to your original win and increase your winning totals. If you fill certain rows with the same symbols, you’ll benefit from multipliers up to 4x in the Win Multiplier feature. The Bonus Round feature sees you get 3 free spins – you’ll also benefit from multipliers which can reach 5x if you fill row 6. If you fill rows 1, 4 or 7 though, you’ll access 3 more bonus features – these destroy multiplier blocks with another cascade, upgrade the symbols on show for bigger wins and give you additional free spins. The Super Bonus Round feature gives you 6 free spins but the multipliers increase up to 8x – you can benefit from 3 winning clusters being destroyed, even more free spins and all winning clusters upgraded. There are also multipliers up to 30x in the Block Destroyer feature! With cash prizes on offer in the Super Bonus Round feature, there’s up to 1,500 times your bet to be won from every free spin. To find out more, check out the Contact video slot review. Not played at Mr Green Casino? With over 1,000 video slots, Mr Green Casino offer you 24/7 customer support, same day cashouts and more promotions than anyone else. Sign up to get 20 no deposit Starburst bonus spins – this is exclusively for CasinoManual.co.uk readers. As soon as you deposit, you’ll get a 100% bonus up to £100 plus 200 more bonus spins (100 on Starburst, 100 on various other NetEnt video slots).